Yesterday my editor revealed the sparkling new cover copy for my debut novel, Hearts of Darkness, the first book in The Deadglass Trilogy. I love it. What do you think? Brilliant, no? It’s similar to the paragraph I sent in my query letters, but somehow much better. I like “hellish catastrophe.” The publishing process is really slow, so please bear with me as I jump up and down about my cover copy. It’s my FIRST. It seems so much more REAL now. I can’t wait to see the cover art! 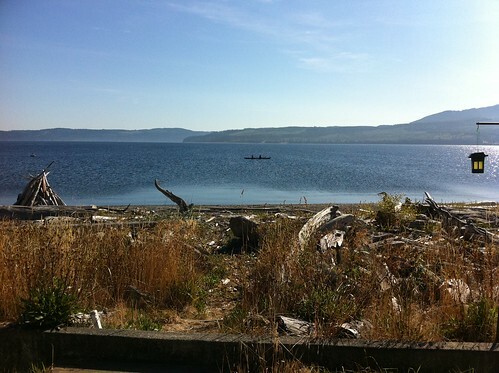 Picture this: A secluded cabin on a spit of land jutting out into Puget Sound with nothing but wind swept seas and the Olympic Mountains to view. Two good friends who also happen to be writing friends. Tea. Cookies. Post-it notes. Sounds like heaven. 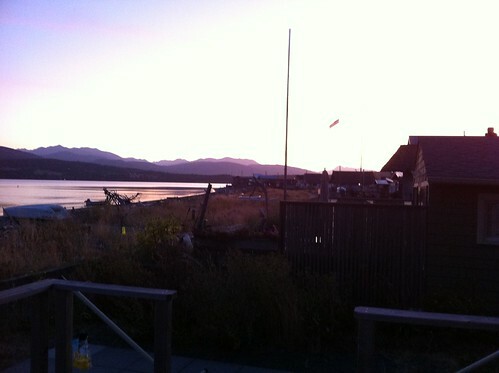 I just returned from a writing retreat near beautiful Port Townsend. Two days of brainstorming, plotting and collaging with my critique partner and friends. I wish it could have lasted longer! We ironed out some of the plot arc of my trilogy and drew a general map of book 3. I’m a bit plotting phobic. I want to know what happens in each scene before I start, but I find that when I nail myself down too much I lose interest and that imaginative spark. On the other hand, striding blindly forward gives me lots of scene starts that have no place in the final draft. I learn a lot about who my characters are on my unplotted journey, but I end up writing thrice as many words as I need before I find my way out of the quagmire. To plot or not to plot, that is the question. Hopefully the more generic map for book 3 will give me the structure I need without wiping out my enthusiasm. I know my characters really well since I’ve written about them in books 1 and 2. I’m really excited to get started….but first I have to finish Hearts of Shadow. We plotted books and trilogy arcs for my two writing friends too. I LOVE plotting other people’s books. The brainstorming phase is the fun, easy part. Finishing the damn book is the hard part. I am so excited to read their books once they finish doing all the hard work! What inspires your creative muse? Do you need beautiful views? Solitude? Does the sun distract you from your work? Filed under Writing | Comments Off on Writing retreat and Wrist pain: are you inspired yet? Anyway, until I get that settled, here is my new lovely blog design! The header I made all by myself. Aren’t you proud of me? The photo I shot at Gasworks Park. It’s the view across Lake Union. Now it just needs my NAME across the top so you know what you’re reading, but Mr. Kira stole his computer back. I am almost finished with the short story prequel to Hearts of Darkness. 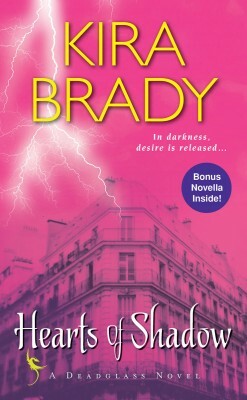 It will debut in July in ebook only, one month before Hearts of Darkness arrives in stores. I am very excited to share it with you, and very excited to have my first published work debut during such a monumental birthday month. (LET THE CELEBRATIONS COMMENCE.) I’m trying not to think about the Impending Birthday of Doom too much, which means, of course, I must fill the month with tons of things to look forward to. And if you all read my book, that would make all my birthday wishes come true. This is a pretty cool talk on artistic expression by spoken word artist Sarah Key. I don’t know much about spoken word, but her speech speaks to the heart of writing novels too. Write what you know, because what you know will help you reach out and understand what you don’t know. She says it better than that, but I can’t find the exact quote without replaying the whole thing. I’d recommend watching it whatever your art form is. The news lately has been blacker than soot. Makes me what to curl up under a rock and shut out the outside world. That’s generally what makes an author an author, right? A person who is most at home in the made-up worlds inside her own head? But that won’t put out the fires that are burning our very real world. I’ve been trying to limit my internet time so I don’t get too overstimulated, which is one reason I haven’t been blogging. If this keeps up, the Mayan 2012 apocalpyse will be right on time. In our little publishing corner of the world the news is not life-or-death, but it is dismal. Since I sold in January, self-publishing has rocked the establishment. It seems like everywhere I turn, people are predicting DOOM for paper books, DOOM for publishing houses, DOOM for bookstores. Since Borders is closing, readers won’t be able to discover Debut Romance Authors! Rumor abounds: Self-publishing will lead to instant riches. Self-publishing will make you lose your shirt. I’m not going to predict anything. I have little control over these factors. The area I have control over is my own story. I’m going to write the best damn story I can, and hope some of you fine folks will read it. I hope my theme that love can light the darkness will inspire you, especially in these tough times. Maybe my books will give you a little respite from the real world. I love the romance genre, because it delivers hope. It holds the promise that the good guys will always win, the bad guys will always get their comeuppance, and true love will conquer all. On Wednesday New York Times Best selling author Madeline Hunter gave a very inspirational speech at the keynote luncheon for the 2011 Romance Writer’s of America conference in New York. I cannot for the life of me remember what she said at the moment–which is the problem with blogging two weeks after an event–but I remember feeling empowered to get writing and to embrace my new role as soon-to-be-published author. Ms. Hunter also gave an informative lecture with Sabrina Jefferies on the numbers (sell-through, print runs, and all that jazz) to PAN members. 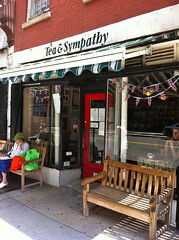 I met my agent — Miriam Kriss of the Irene Goodman Agency — for the first time on Wednesday afternoon for tea at Tea & Sympathy, one of the highly reviewed tea places in New York. After our schedules for lunch didn’t pan out, I told her I simply LOVED afternoon tea. Nudge, nudge. Wink, wink. So she took me to this place. 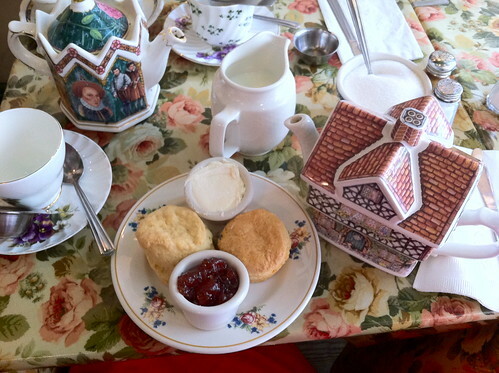 We had cream tea, which included scones, devonshire cream, and tea. I had English Breakfast. The teapots were very fun. Mine was shaped like a house (see photo). When I got The CALL from Kensington in January, I quickly emailed a couple agents at the top of my list and Miriam responded. She took the weekend to read the manuscript and offered representation on Monday morning. We chatted on the phone. I am awkward on the phone. Fortunately, I asked about graphic novels, and Miriam launched into a history of comic books. I didn’t have to talk much. It was enlightening. I signed with Miriam after talking to a couple clients and reading other clients’ blog posts. Everyone raves about her. Since then, we’ve talked on the *gulp* phone for a few minutes every two weeks. I was nervous about meeting her in person, but I had nothing to worry about. She was very personable. And there was TEA! The RWA National Conference was fun, but exhausting, as 2,000 writers converged on the Marriott Marquis to learn, network, and drink. We took a family vacation a few days earlier and saw the Central Park Zoo (which was sad) and the Children’s Museum (which was aweseome). On Tuesday I took the baby to the literary signing. The line of rabid romance readers went out the door and around the block. It was a madhouse. We decided to wait an hour or two for things to calm down, and although we bypassed the line, it was still all madness inside the ballroom. And we missed the books. *sob* I could barely hear a thing, so if you tried to talk to me and I gave you a dazed smile, please don’t take it personally. Me: OMG I LOVE YOUR BOOKS! Me: Can I take a picture? That was it. She had run out of the Outlander Graphic Novels. *sob* I made it out of the signing with only one book and only talked to a handful of the authors I intended to. I met the delightful Karina Cooper, a local debut author who writes post-apocalyptic paranormal romance set in my favorite city. Book 1, Blood of the Wicked, was hawt, so I was glad to get my hands on an autographed copy of book 2: Lure of the Wicked. The baby cried when she saw Larissa Ione, but was appeased by the bribe of her very own demon ducky. I’m not the only one who was overstimulated by the crowd and heat. After the signing, we met the lovely Christine, a blogger who I’ve known online for a number of years. It was great to finally meet her in person, but I didn’t get to talk long as I would have liked. Next time! Sinatra is in my head and a little knot of anxiety is in my belly as I contemplate our impending trip to New York City for the 2011 Romance Writers of America national conference. I’m packing my bags and leaving Saturday. Sunday and Monday we’ll tour the zoo, Central Park, and children’s museum (I’m bringing my family). Tuesday I have a lunch date with my editor, who I’ve met only the once (2009 ECWC). He seems very charming and approachable, so I’m not too nervous about it. My agent (Miriam Kriss) I’ve never met in person. We are trying to squeeze in a time to meet too. Tuesday evening is the 2011 “Readers for Life” Literacy Autographing, where 400 romance authors will crowd into a ballroom to sign books and raise money for literacy programs. If you live near New York, please stop by. This event is open to everyone. I won’t be signing, as my book isn’t out yet, but I’ll be there chatting up authors and readers. New this year is the opportunity to collect Romance Trading Cards (like baseball cards). I’m particularly excited about Meljean Brook‘s cards, because she commissioned original artwork for them. They turned out beautifully. Tuesday, June 28, from 5:30–7:30 p.m.
After the signing, stop by the Marriott bar to chat with Romance Bloggers and authors. This is also an open event. 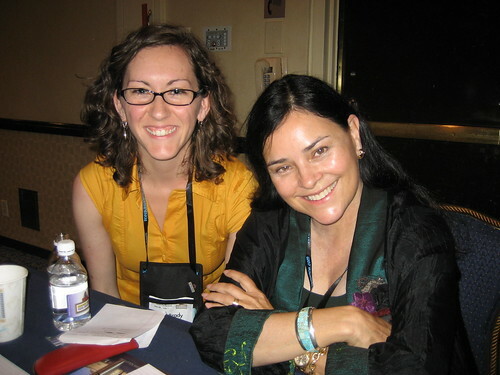 I met a number of these lovely ladies back when I first started blogging about romance, and had the chance to meet in person at the 2008 RWA conference in San Francisco. Seems like eons ago! I will try to stop by, but might have to wave from the door, as I’ll have my munchkin with me. Wednesday the conference starts. The PAN retreat (for published authors) is after the keynote lunch. The big event that night is my publisher’s cocktail party, where I’ll meet other Kensington authors. Thursday and Friday are full of workshops, and Friday evening is my literary agency’s cocktail party. Saturday we fly home. It’ll be a full week! I’ll be posting photos on my facebook page, and maybe also my flickr page for those of you who don’t have facebook. I’ll also tweet some from the conference. Are you going? What are you most excited for? I wish I were still a book blogger so that I could go to the Harlequin Tea and get a fascinator! All across the country romance authors are gearing up for the 2011 Romance Writers of America National Conference in New York. When I say gearing up, I don’t just mean getting ready. I mean BUYING AN ARSELOAD OF RIDICULOUS SHOES AND DRESSES. I’m no exception. I bought one pair of shoes, four dresses, and a skirt. This will be my second RWA conference. 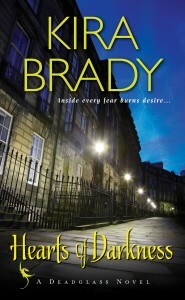 The first was 2008 in San Francisco, when I was a very young, very naive, aspiring romance author. 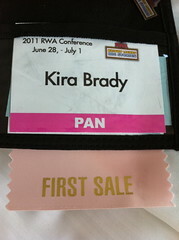 Now I’ll return with my pink first sale ribbon and my PAN membership card. WOOT! At that first conference one experience stood out, a premonition of Good Things to come, and I’ll share what I wrote then. …and doesn’t see anyone she knows. Well, she sees an author, but Authors are intimidating, so she sits down next to an unknown woman eating alone at the bar and strikes up a conversation. The award ceremony starts in an hour, so no one is wearing name tags and everyone is dressed to the nines. The girl asks what the woman is eating, and orders a cheese plate, rambling on about being a vegetarian and how this is her first conference and how exciting it all is. Strangers, dontcha know, being so much less intimidating than Authors. The woman is very nice and asks who the girl was most excited to meet at the conference. Joanna Bourne being the answer, the two share a glowing moment gushing about Ms. Bourne and how they would give their left foot to read the next book, now. Then the woman asks where the girl is from, and they chat about the Emerald City and how nice the romance writers are there. “So where are you from?” says our not-so-intrepid and rather clueless heroine. An Editor, dontcha know, is ever so much more intimidating than an Author. “What is your name?” asks the girl in a very small voice, feeling like she’s nearing a very large cliff. 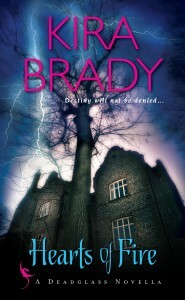 Kate Duffy was an editor for Kensington Publishing, the house that bought my trilogy. Hearts of Darkness was still just a glimmer of an idea at that time. Ms. Duffy passed away in 2009. Now I think back on that chance meeting, and I wonder if the universe was somehow conspiring even then to set me on this path. If it were a book, I’d say definitely. There are no coincidences in fiction. Have you ever been to a writer or reader conference? What Fabulous outfit would you wear?